Take all the struggle out of pulling with electrical cords. Now with our RV electrical adapter with power grip and handles, it makes hooking up and unhooking your RV electrical cords a breeze. 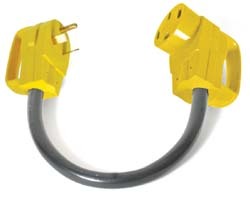 Our RV electrical adapters come in many sizes.